Latest News from Living Hope Ministries. Happy New Year to all of our Living Hope Prayer Partners. Australia, Benin, Bosnia, Botswana, Bulgaria, Burundi, Cameroon, Congo, Cyprus, Ecuador, Ethiopia, Finland, Gambia, Ghana, India, Ireland, Kenya, Latvia, Liberia, Macedonia, Malawi, Malaysia, Myanmar, Nepal, New Zealand, Nigeria, Pakistan, Peru, Philippines, Poland, Romania, Rwanda, Sierra Leone, Slovenia, South Africa, Spain, Tanzania, Uganda, Ukraine, United Kingdom, USA, Zambia. We praise God that successful teaching calls were made to Ethiopia, Pakistan, Uganda, Kenya and Sierra Leone, over the past few weeks. Please pray for our work with all of the telephone teaching groups this year, as we continue working through the Living Hope Pastors Handbook, having completed the 'Overview of the Bible' and the 'Seven Things' doctrinal section. Weekly/Monthly Seminars - Kenya, Liberia, Malawi, Pakistan and Uganda. Pray for the radio going out on Uganda Radio and Radio Voice in Zambia, which reaches much of Central and Eastern Africa. Pray also for our TV work. We have programmes on Family Media - Kenya, Lighthouse TV - Uganda, Mutual Faith TV - Philippines and Rakshna TV - India. Pray that these messages will be effective and for our work to strengthen the Living Hope YouTube channel, where there are already some programmes, which can be found by searching 'Living Hope Ministries Richard Brunton'. Remember Caitlin and her family, as they continue to take in the loss of Caitlin’s father and also Tea in Bosnia, who lost her Dad recently. In Kenya, Robert is still bravely fighting cancer. Pray that his faith and courage will remain strong. In the Congo, Isaac recently lost a very young granddaughter. Please remember the family at this time. In Malawi, Aubrey’s wife, Grace, was struck by lightning and suffered severe shock and bleeding as a result. Pray for a full recovery for her. In Sierra Leone, Emmanuel has been unwell and his son, Junior, has a particularly strong case of Malaria. Junior was born just before Emmanuel’s first wife died. Please pray for them. Pray for Željko and Lela as they seek more leaders to cover their growing work, especially in the Sarajevo church. Remember Fabian and Levis, particularly in their prison ministry. Pray for Antonio as he sets out a vision for the 70 churches that he oversees in Ecuador. SJ is taking over responsibility for some of the TV work in India this year. Pray for God’s provision for him. Peter, Grace, Silas and John need our prayers, as they manage Living Hope Kenya as well as their own ministries and churches. Pray for Emmanuel, as he hopes to start a regular meeting for key leaders this month. Aubrey is looking to plant new churches this year. Please pray for him as he cares for the churches already established, as well as attending to new projects. Rasheed is under a lot of pressure trying to support Christians in particular areas and still needs a breakthrough regarding a new computer. Pray for God's wisdom and provision. Pray for Chio while she waits for a visa to rejoin her husband Michael in the UK, that she will have productive ministry amongst the pastors in Peru. There has been a real upsurge of demand for ministry on radio and TV over the Christmas and New Year period. Pray for God's saving grace. Peter and Rose have a big family, as well as their good ministry in several churches. The recent loss of Caitlin's father, Paul, has impacted them all and they would value our prayers. We are working on written, audio and visual materials, for our Spanish-speaking friends in Living Hope's growing family of South American countries. Please pray that these will be a blessing to them. Also pray for Charlene and Paul, as this Silver Jubilee year for Living Hope will create a lot of extra work. Christmas Wishes from the Living Hope Team. And he will be called Wonderful Counsellor, Mighty God, Everlasting Father, Prince of Peace. Of the increase of His government and peace there will be no end. (Isaiah 9:6-7). Sometimes descriptions can be exaggerated but not the description of Jesus, given here in Isaiah, who is God coming into our world to save us. Words can never express the wonder of who He is. What a privilege it is to serve Him and what a year it has been for us in Living Hope! The team has grown and missions have taken place in Bosnia, Bulgaria, Colombia, Ecuador, Ethiopia, Kenya, Malawi, Poland, Rwanda, Sierra Leone, Tanzania and Uganda. We brought together the Kenya groups who are taught by telephone and we were able to send Peter from Nairobi to Mombasa. 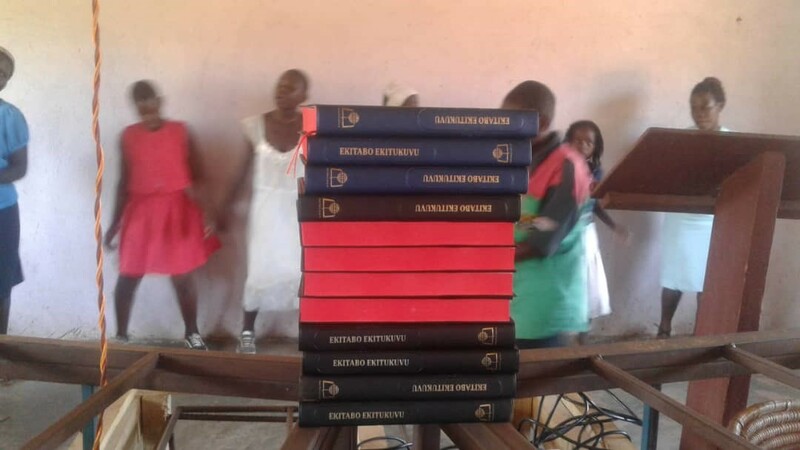 We also provided teaching via telephone, Skype, TV or radio to the Congo, Ethiopia, India, Kenya, Liberia, Malawi, Pakistan, the Philippines, Sierra Leone, Uganda and Zambia. There has been encouraging news of people coming to Christ, particularly in Malawi. Only the Lord knows the response of the heart, but we know that our Mighty God is working and bringing His peace to many! Reports from Ecuador, Colombia, Bulgaria and Sierra Leone are below. Jesus, our Wonderful Counsellor, Mighty God, Everlasting Father and Prince of Peace, was truly with us. Praise the Lord! We had a very special time in November, when we gathered a team of people to plan next year’s mission activity. By God’s grace, we will share details of that programme in our next letter, as we look towards our Annual Gift Day on Sunday 24 February 2019 and our very special day, Celebrating 25 years of Living Hope Ministries on Saturday 19 October 2019. Christmas, first and foremost, is a time to thank God for sending the very precious and unique gift of Jesus. It is because of Jesus that Living Hope exists and we thank all those who pray, give and serve with us, here in the UK and across the nations. We also remember those who served so well with us in the past and are now in His presence. Truly, may the Prince of Peace draw near to their loved ones! May the Lord bless you and your families this Christmas and may we all know His peace, protection and joy as we move into 2019! 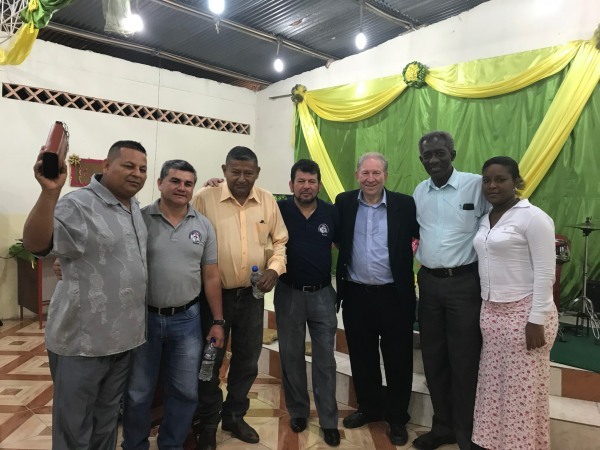 Our time in Ecuador was very busy and we visited a good number of leaders and churches. There were some very special times of worship and sharing. Many people came forward for prayer and there was a real sense of the Lord’s presence. On one occasion, there was some spiritual opposition in the form of loud music from outside but that diminished and in the same meeting, God showed Richard that some people were enduring the suffering of unexpected bereavement. Around 80 pastors and leaders came to the Leaders’ Seminar, when Richard shared from Haggai and the book of Jude. We also had some very encouraging times of prayer and fellowship. Our time in Colombia was very special and also very challenging. The church, led by Fabian, was like a number of churches in Medellin, very committed to ministry in the prison. 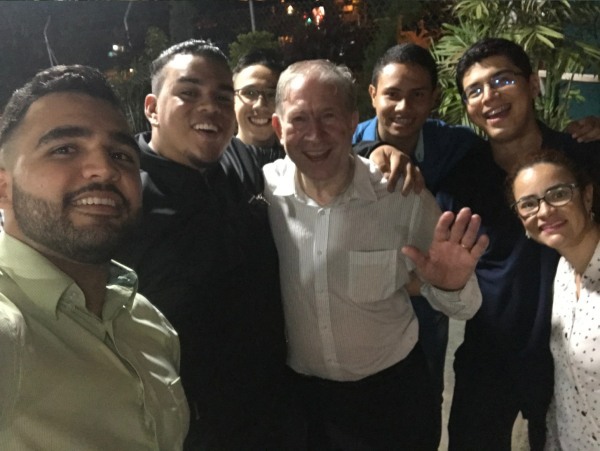 We met in the main Medellin prison, young men who had been converted and discipled and were exercising Christian leadership among the many other prisoners. We also had the privilege of taking a service and preaching the good news of Christ to all who were listening and 5-6 responded to the opportunity to receive Christ as Saviour and Lord. The church we worked with had a very lively worship group. Their Saturday congregation is a very open meeting and the Sunday group was for those committed to the church on a regular basis. It was great to be with these people and to see a good range of ages committed to the word of God. We will seek to provide some studies in leadership to help them in their training programme. The testimony of one man was very powerful as out of a life of crime and grief, he wonderfully found Christ and was truly transformed. God is clearly at work in Colombia! The Vidin congregation welcomed the teaching on “Hannah’s Prayer” (1 Samuel 1). One lady told us that she had been studying this passage for several weeks, and particularly valued what had been said. 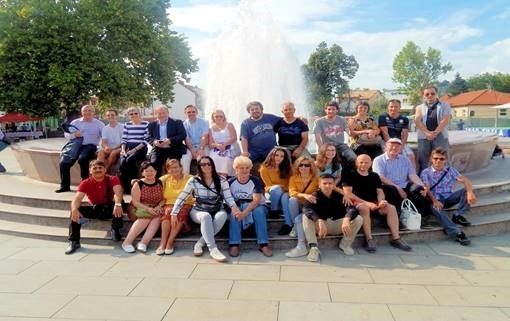 Next day was an 'Away Day', which was the first time that all 3 of the Vidin Church congregations were meeting and worshipping together. Clearly, they were still getting to know each other, but it was a start. Simon brought 2 messages from the book of Haggai. Initially, he was uncertain if this text would be relevant, but very quickly realised (and Peter confirmed later) that God was clearly speaking through these passages. After lunch, Ruth led a craft activity, which showed that, with God at the centre, all the skills throughout the church could be used together. There was also a time of testimony with members from each congregation sharing. Kevin was able to share his testimony, and the day after, a lady told Kevin that she had found his testimony encouraging – which encouraged Kevin too! Ruth was able to make a connection with Nevena and we will see where this will lead. Kevin was deeply moved by what he saw and experienced, and, considering this was his first overseas mission trip, he did very well. Chris has been several times to this part of the world, which has been deeply troubled by Civil War, Ebola and mudslides. Praise the Lord! This visit was at a reasonably stable time and it was the first visit for our brother Jean. The leaders’ seminar saw numbers steadily rise day by day and overall, there were about 170 leaders who gathered from between 50-55 churches. They seemed particularly provoked by Haggai and the challenge as to what kind of temple they were building. They responded well to recognising that church is about people and community, not just buildings. Jean sought out some discussion with small groups to get good feedback and was encouraged by what he heard. The evening meetings attracted mainly local people and the challenge to get rid of false gods and idols was very important. Sadly, people can be believers but are still trying to hold on to old ways. A visit to the prison in Kenema is always part of the programme and it seemed as many as 100 prisoners made a response to the Gospel. Another feature of this visit was to have Emmanuel from Liberia. Chris was very blessed by the devotion to teaching the word by this brother and we look to explore a mission to Liberia in God’s time. 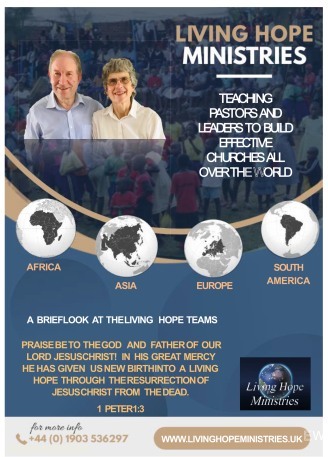 Latest News from the Living Hope Team. 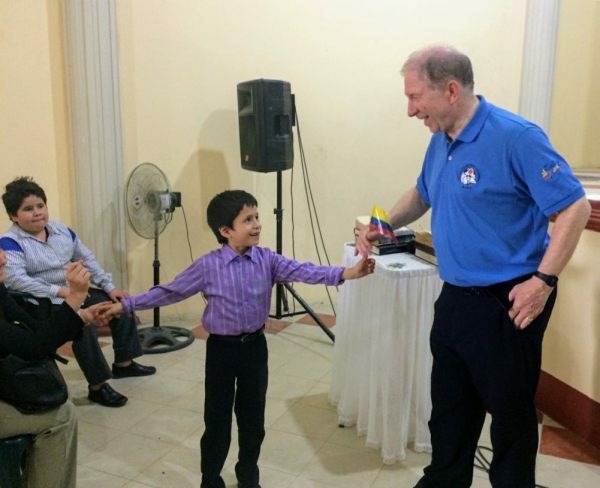 Pictured above is a little boy giving Richard Brunton a flag of Ecuador. 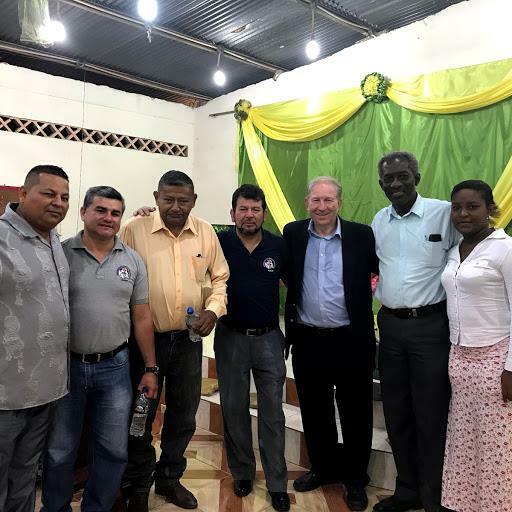 We are grateful that Simon, Richard, Chris, Jean and Jose have all safely returned from missions in Bulgaria, Sierra Leone, Ecuador and Colombia. Please pray for the seminar in Congo on November 15, and for Bishop Peter heading for Mombasa for Living Hope on Friday November 23-25. With Young People in Medallin. UK Team: Richard, Elaine, Chris, Val, Nigel, Terry & Di. We do thank the Lord for His protection as people gathered from 6 countries to be together for teaching, fellowship and developing deeper friendships between each other. Andrzej and Richard were the main speakers and the ministry was extremely well received. Zelkjo and his team did a fantastic job making sure that everyone had a place to stay and were catered for throughout the days together. It was late Wednesday night when the last delegates were received, but the sense of oneness and joint purpose was seen from the beginning. The times of worship were very special, as we encouraged people to sing in their own language and not be tied to English. The same principle was adopted with the times of prayer; this seems to bring liberty and freedom in praising God and calling upon His name. Some of the families brought their young people and we aimed to make them feel part of the conference. It was great joy to hear them pray. Several of them led prayer before the teaching session. They could have embarked on a different programme at one point, but they chose to be part of the conference. One senses that, in the future, some of these young people will be leaders in churches in their countries. We were able to have a better understanding of the challenges and trials that our brothers and sisters face in the places they serve the Lord. There was lots of fun, as well as significant moments where the presence of God was clearly felt. Andrzej from Poland says "Thank you for the Tuzla LHM Conference. I have been blessed and encouraged!". Svetla from Macedonia says "The time I spent with friends in Christ was unforgettable." Simona(Svetla’s daughter) from Macedonia says: "I was glad to take part in the conference; thank you for inviting us." Elaine says: "It is good to appreciate our brothers and sisters and to pray for them more intelligently." 19 October 2019: Celebrating 25 Years of Living Hope. 10 October: Richard leaves for Ecuador and Columbia, returning 23 October. Richard will be joined by Jose from Meadow Grove and Chio Fordham from Peru. 12-15 October: Simon with a team from Goldstone church head for Bulgaria. 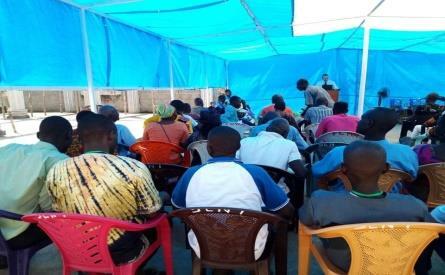 18-27 October: Chris and Jean are in Sierra Leone. Living Hope is gathering leaders from several European Countries in Bosnia on 5-8 September. Pray that each one attending will be encouraged, protected and will return to their countries with fresh vision for their respective ministries. Living Hope Teams – The number of people involved in missions is growing and we are grateful to be in contact with 30 UK churches and with people in 30 countries. We value prayer for this to develop in the coming months. By God’s grace, Living Hope will celebrate 25 years of ministry on 19 October 2019. There will be a celebration in Lancing in the UK and we encourage prayer across the nations on that day. To him who is able to keep you from falling and to present you before his glorious presence without fault and with great joy – to the only God our Saviour be glory, majesty, power and authority, through Jesus Christ our Lord, before all ages, now and for evermore! Amen. We thank God for the New Year that is in front of us, confident that we have a God who will keep us from falling and who will enable us in every way. We are so grateful for the many ministry opportunities that God gave us over the Christmas period and it was particularly exciting to hear of over 100 people giving their lives to Christ in Sierra Leone! So many doors are opening and we are planning visits in April to Ethiopia, Kenya, Malawi, Rwanda, Tanzania and Uganda. The teams are all in place and we look to God to make each visit the best that it can be. We look forward to standing with Aubrey as he plants a new church in February. 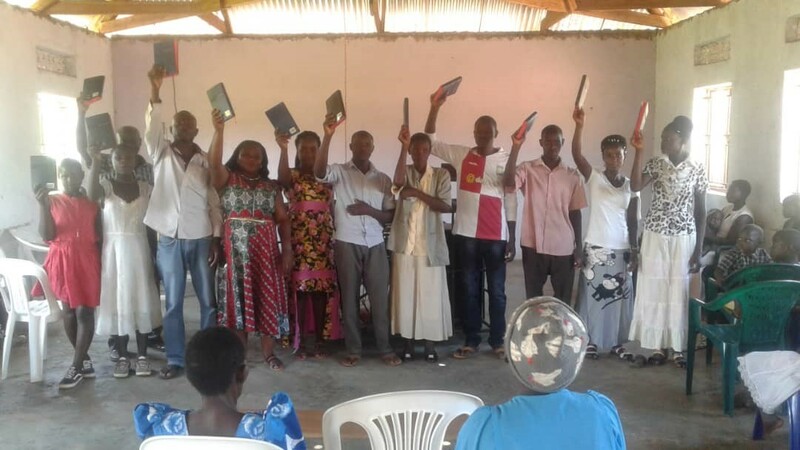 In the Congo, Isaac has asked for 4 telephone seminars in February and March, so we look to help him and Eddy in Burundi, is anticipating a visit from Augustine in March. We are very conscious of the need to be attentive to the Lord. Without him, we can do nothing but, if we follow his leading, then nothing is impossible! Our latest magazine is enclosed, showing the ways in which Living Hope has grown beyond one person to now involve a considerable number of people. Our Living Hope Sunday and Gift Day is 25th February 2018. We have found it very valuable to set aside one special day each year, when we ask the churches that we work with to pray for Living Hope, along with an opportunity for individuals and churches to give to Living Hope. We never overlook that some are giving regularly throughout the year but the Gift Day is an opportunity to get 2018 off to a good start and we look to God for a faith-filled response. There are countless numbers of people in the countries where we work, who do not know Jesus and are, therefore, spiritually lost. 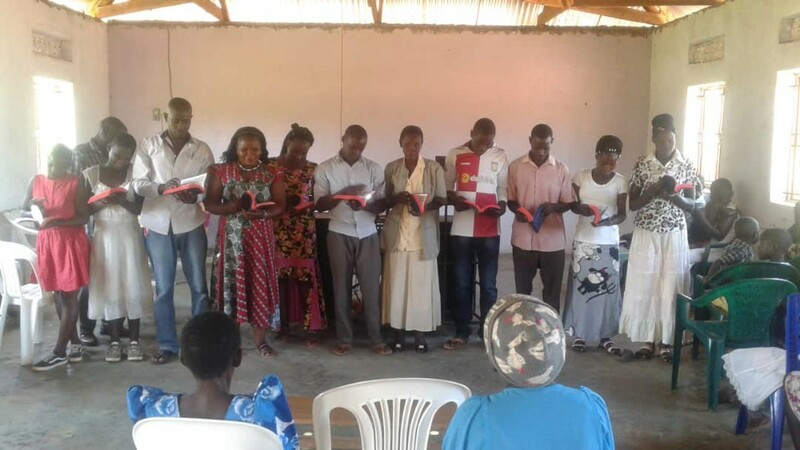 There are also many pastors who are serving the Lord but who have had no formal training or in-depth Bible study – these are the needs that we seek to meet through the work of Living Hope Ministries. May God provide in all that He has planned for you this year and may He help us together, through the work of Living Hope, to accomplish all of His purposes for us in 2018!